Mark Henshaw is a decorated CIA analyst who uses his experience as a foundation for his fictional thrillers. His Red Cell series includes Red Cell, Cold Shot, and The Fall of Moscow Station. He is a former member of the CIA’s Red Cell think tank. 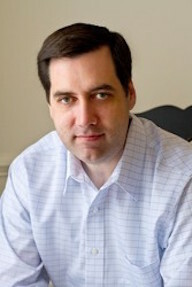 In 2007, Henshaw was awarded the Director of National Intelligence Galileo Award for innovation in intelligence analysis. He has received eighteen Exceptional Performance Awards. Henshaw earned his bachelor’s degree in political science from Brigham Young University and two master’s degrees, one in business administration from BYU’s Marriott School of Management and a second in international relations from BYU’s Kennedy Center for International and Area Studies. He also graduated from the Sherman Kent School’s Advanced Analyst Program. He is a member of The Church of Jesus Christ of Latter-day Saints and lives in his native Virginia with his wife, Janna, and family. He served a mission to Argentina. This page was last edited on 27 May 2017, at 15:21.